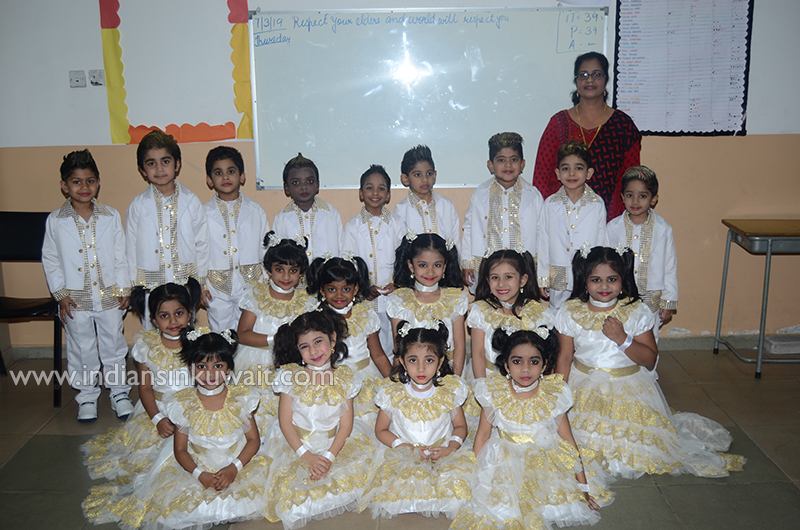 Kids International Pre School celebrated its Second Annual Day on Thursday, the 7th March 2019. If there are no stars, there won’t be any beauty in the sky. If, there are no difference of opinions there won’t be any creative innovative ideas. Similarly if there is no Annual Function in our Pre School, there won’t be any chance for our young and dynamic tiny buddies to uphold the pride of the Pre School, to catalogue the challenges we face, the endeavors we made and the success we achieved and to show what we were what we are and what we will be. The programme commenced with the recitation of verses from Holy Quran followed by its translation. This entailed the bouquet presentation and pinning of badges. The Principal of Kids International Pre School Mrs.Nilofar Qazi welcomed the guests and introduced the Hon’ble Chief Guest Mr.F M Basheer Ahmed- Principal of India International School – Mangaf and Mr.Abdulla Hadi Nahar Al Hajiri , and the Guests of honour Mr.Muhammed Hoshdar Khan (Chairman of Khan group of companies),Mrs.Manjumithra Sarath (Director of Shivadam School of dance) and Mrs.Samma (Manager – Commercial Bank of Kuwait). Chief Guest Mr.F M Basheer Ahmed- Principal of India International School – Mangaf shared his thoughts on unique methods adopted by Kids international Preschool in imparting knowledge to impressionable minds. This was followed by the distribution of Certificate of Participation to the “Mom’s” for their contribution in “Inner Wheel” programme managed by the Administrative Manager Mrs.Najiyah Kader. The cultural programme “Blue Planet ……A fantasy far far away, was based on the theme in which an Alien (KI 20) arrived to the Blue Planet. He visited and witnesses the jungle safari, world of rhymes in KIPS, alluring dance of Arabic world, Indian cultural heritage and Hollywood Vs.Bollywood. 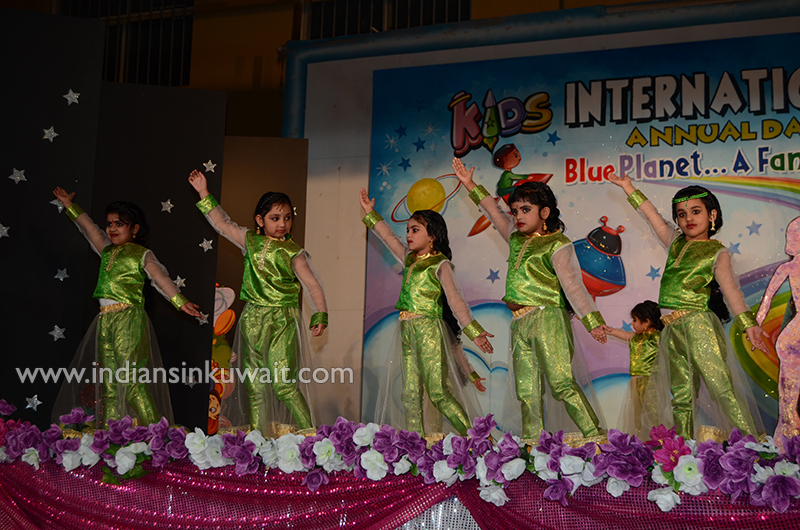 Then the aliens of planet KI showcase their performance after they learnt to groove from the people of Blue Planet. The smart anchors of the cultural programme were Julia, Kashvi, Dahab, Zaki, Anis, Safiyullah, Kelin, Pawani, Bushra ,Gautham, saad, Layan ,Zidan ,Huda, Ehan, Hayden, Alishba, Shivalika and Sreevedha. The School director of IIS(M) Mr.Malayil Moosa Khoya was superlative in his appreciation of the students and teachers for presenting a classic program. He lauded the relentless hard work done by Principal Mrs.Nilofar Qazi, Vice Principal Mrs.Gayathri Bhaskaran and the Administrative Manager Mrs.Najiyah Kader for presenting a mesmerizing experience of close encounters of the third kind.